Travers Day, featuring the legendary Travers Stakes (which dates back to 1864), is the most popular day of the Saratoga summer racing meet. 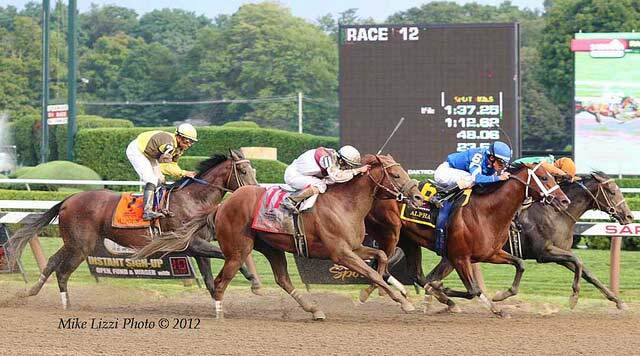 Nicknamed Saratoga's Midsummer Derby, the Travers Stakes is a Grade 1 race for 3-year-olds, traditionally held on the last Saturday in August each year. This information is current as of 8/22/18. When the Saratoga Racing Association named the Travers Stakes for William R. Travers (one of the founders of America's oldest race course), they sought only to honor a man who'd made his mark on the sport of horse racing. Mr. Travers' horse, Kentucky, won that first in 1864. The present distance of 1 1/4 miles is a perfect distance for contemporary three-year-olds. The race is open to colts and geldings, carrying 126 lb (57.2 kg) and fillies, carrying 121 lbs. (54.9 kg). In 1941, Whirlaway became the only horse ever to win the superfecta: he'd won the Triple Crown, then went on to take the Travers, as well. In 1962, Jaipur won by a nose-bob in track record time over Ridan, who was considered to be more talented. The long battle (the entire 1 1/4 miles) saw the two horses duke it out the entire distance of the race. Point Given, a gorgeous, big, 17hh monster, won the Travers on August 25, 2001. 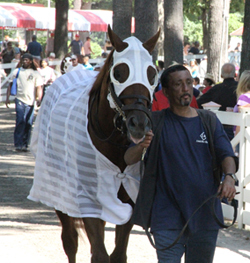 That day, Point Given drew a record Travers Stakes Day crowd, 60,486 fans. The race brought in a total betting handle of $34,529,273. This was also a Saratoga record to that date. The Travers Trophy is known as the Man O'War Cup, and was designed by Tiffany & Co. The trophy was named for Samuel Riddle's great Champion: Mr. Riddle donated the trophy as the permanent award for winning the race. A gold-plated replica is presented to the winner every year, by a member of the Riddle family. The winner of the Travers Stakes will receive an extravagant floral blanket, a beautiful blanket of flowers to drape over the horse, hand-made locally with over a thousand carnations. The Travers Canoe has been a lovely tribute to the winners of the Travers, every year since 1961. Every year, the canoe is painted in the colors of the silks of reigning Travers winner. A canoe has been a fixture in the infield pond since 1926, but it wasn't until 1961 that the canoe became affiliated with the Travers. The city of Saratoga Springs NY celebrates the entire week leading up to Travers Day with various events, including a restaurant week, racing events, live music and more. It's the annual Travers Festival! The Travers always has been a race that sets the blood to flowing, whether you're a fan whose favorite horse is running; an owner or trainer, who's entered your prize horse or a handicapper whose reputation hangs on the line. The Travers has earned its nickname, the Midsummer Derby, because truly, this oldest of stakes races for Thoroughbreds is a test of the mettle of a horse. The horse who trots off the legendary track at Saratoga with the Travers flowers about his neck is a Champion, indeed-and a horse whose name is permanently part of the lore and history not only of Saratoga, but of horse racing, itself.